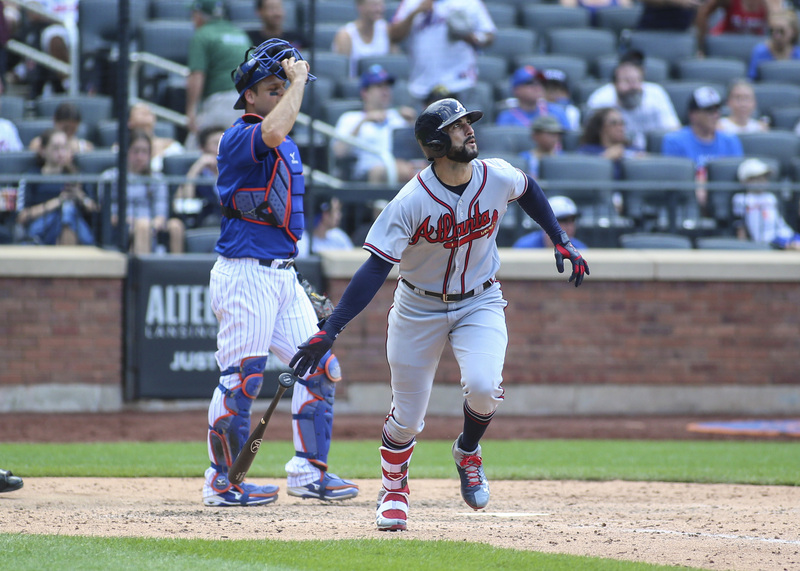 Though you might consider Sunday’s action against the Atlanta Braves to be one of the many soul-crushing defeats that the Mets have suffered this year, it wasn’t all bad. Some good occurred. Salvageable in a game where the Mets blew a 3-0 lead, as well as a game-tying homer in the ninth inning, the best starting place for this conversation is Corey Oswalt, who looked decent yet again. Oswalt worked six innings of one-run ball before Mickey Callaway sent him back out for the seventh inning. Until that point, things had looked pretty good; Oswalt had surrendered just five hits (all singles except Julio Teheran’s solo homer to left), struck out four and walked none. If he had been stopped there, the 24-year old rookie would’ve handed the bullpen a two-run lead with nine outs to get. But, of course, this is the Mets. That isn’t what happened, and Oswalt’s seventh inning went something to the tune of single-homer-single, a rough ending for a generally good performance. Should he ever be able to overcome his home run problems, Oswalt looks to be someone who has a lot to gain down the stretch. It’ll be fun to see if he can continue this trend of decent performances. One which started in July. As for the Mets’ performances at the plate, Wilmer Flores and Michael Conforto recorded multi-hit games. Jeff McNeil continued to hit well, recording the only non-home run extra-base hit of the game. A minimalist might even say he doubled. Devin Mesoraco homered for the first time in a month to tie the game in the bottom of the ninth. All that is great and looks good, but one performance stuck out: Austin Jackson. The left-for-dead outfielder was claimed off waivers from the San Francisco Giants toward the end of July, which appears to have been a very good decision. Maybe Jackson has taken tips from Jose Bautista, another waiver claim that played well for the Mets upon coming over. Maybe Jackson got upset about being a waiver transaction between literally the Giants and Mets. All we know is that, coming into Sunday, Jackson was 7-for-22 with one home run as a Met. Leaving Sunday, Jackson is now 8-for-24 with two home runs. Suffice it to say, Jackson obviously doesn’t have a long-term fit with this team. The Mets, should Jackson continue to hit well for the rest of the month, might even try flipping him before the waiver-deadline at the end of the month. Regardless of how he plays, though, his ability to serve as a fourth outfielder will prove interesting for Callaway the rest of the way. The Mets lost a close one. The Mets lost a game they should’ve won. The Mets, well, had one of those games that drive a fanbase crazy. It was right there, and then it wasn’t. Such is the nature of the beast, I guess. Winning games becomes secondary, at this point, to the development of players like Oswalt. It’s good they tried to extend him, as he even finished below 90 pitches. Callaway leaving Oswalt in for the seventh inning proved to be a crucial mistake, but it wasn’t a terrible decision. It just didn’t happen to work out this time. The Mets welcome Cincinnati to Citi Field as they kick off a week featuring six games against the Reds and Miami Marlins. This week presents a real chance for the Mets to win consecutive series for the first time since April, plus a return to Citi Field for Matt Harvey. Noah Syndergaard will go up against Homer Bailey as the Mets begin what will surely be an interesting week.